Before you read this column, I want you to pause for a moment to consider the following question: How could we make geography learning more enjoyable for young people? My nonscientific research indicates that about 1 percent of the general public enjoy learning geography so much that they cannot imagine a way to make it more enjoyable (you know who you are). The rest of us tend to generate ideas like making geography learning into a game, making it more relevant, or adding rewards. I don’t think people’s answers to the question are nearly as interesting as what flashes into their minds when asked to think about geography learning. My nonscientific research on this reveals that most of us picture very traditional classroom activities: memorizing place-names and locations, learning to interpret maps, reading about foreign cultures, analyzing population pyramids, and tracing migration paths. Two things tend to characterize that image: it doesn’t feel relevant or useful to the learner, and it doesn’t feel inherently enjoyable. So when we think about improving geography learning, we think about how we can change those experiences. There are a small number of people out there, however, who summon up very different images when they think about geography learning. Maybe they never experienced traditional geography education, or maybe they experienced it and have completely rejected it as a model for learning. They envision activities that feel both relevant and enjoyable. These are the people we need to find and listen to, because they don’t think about improving geography education by incrementally improving traditional approaches. They think about completely new approaches to geography teaching and learning. The Geography Collective's Mission:Explore website. Its approach to engaging people in guerrilla geography is through a set of miniadventures that are designed for young people to do by themselves or with adults. These adventures—or “missions,” as the Geography Collective calls them—encourage exploration. They challenge participants to explore either new or familiar places with new perspectives. The Geography Collective shares its missions with children, parents, and educators through a series of books and a website, Mission:Explore. 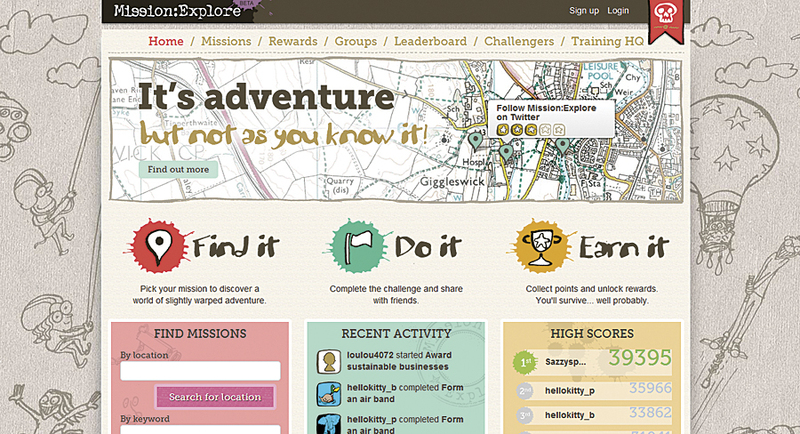 The website offers points for completing missions and allows explorers to collect points toward “badges” as rewards. Behind the playfulness and quirkiness of the Geography Collective’s missions are carefully considered philosophical and educational stances. One is that young people should be encouraged to explore their surroundings and express their own opinions about the positive and negative aspects of different spaces. Another is that they should recognize their own role in shaping the world. Underlying all of what the Geography Collective does is the goal of teaching geography as a method for observing the world and deciding how to act in it. The Geography Collective does not position its approach to geography learning in opposition to traditional geography or even as an alternative. It presents its approach as providing an additional set of experiences that are disappearing from the modern world, where children are taught that all the interesting things in the world have already been discovered and adults believe it’s more important to protect young people from the hazards of the world around them than to give them the chance to explore it. The Geography Collective is one of the most creative groups in geography education today, and every time I learn more about its work, I get more excited about it. However, I do find myself wishing that creative approaches to geography teaching and learning were not so unusual. This is just one transformative approach to geography learning, and it is not going to resonate with everyone. Where the Geography Collective’s approach is quirky and playful, others might be practical and serious—but equally effective and motivating to learners. I can’t help feeling that truly creative approaches to geography learning are discouragingly few and far between right now. Too few people are even thinking about geography education, and those who are still focus too much on incremental improvements rather than entirely new approaches. We should take the Geography Collective members and others like them as inspiration. We must challenge ourselves to think more creatively and seek out and promote the creative ideas of others. Of course, you may already have a break-the-mold idea for fostering geography learning, or you may know someone else who does. If so, please share it with me on the Geo-Literacy page on Facebook or on Twitter at @NatGeoEdelson.